Discussion in 'Henson People' started by Beauregard, Sep 22, 2007. Dave Goelz is an awesome performer, with some of the Muppets more memorable muppets on his list of achievements (such as Zoot, Gonzo, Beauregard, and Bunsen). He's also a man dedicated to the craft of puppetry, and the Muppets themselves...joining tours, making appearances, and generally being awesome. He once mentioned a story about receiving a top-secret phone-call about a possible future Muppet project...and got up to find it here at Muppet Central. This and much more certainly make the fascinating man known as Dave G worthy of an appreciation thread. Welcome to DaDa, Dave's Appropriate and Distanced Admirers. Please wipe your feet on the mat as you come in. *wipes feet* *jumps in and parties* WOOT! Dave is my all-tiem favorite performer! I LOVE all of his characters! But mostly Gonzo... And Boober and Zoot and Beau and Bunsen and Bill Bubble Guy and World's Oldest Fraggle and Philo and and and! I love them ALLLLLL! Dave ROCKS! As one who has come into close encounters of the Gonzo-nostril kind, and hath watched Muppet Music clips directly in front of the man, I am pleased to join such a respectable group, wipe my feet, and announce myself as an admirer of Dave Goelz. However only appropriately and from a distance. Surely no mental images shall be found in the likes of this fan-group, no sir. Lol, cute name for the group, Beau! Dave is awesome! He's such a terrific performer, and a really great guy. He definitely deserves this thread! Here's to you, Dave! If it can be argued that at the heart of Frank's performance of his characters is heart, then it can certainly be put forward that at the soul of Dave's characters is an amazing depth of soul. 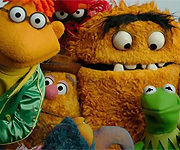 Recently, on my Muppet Wiki user page, I decided to make a gallery for some of my favorite Muppet characters. Mainly favorites from The Muppet Show and related productions, and I realised that most of Dave's characters from such productions were included. 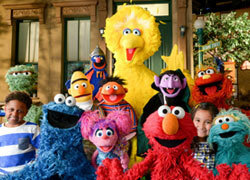 These characters are, of course, Gonzo, Bunsen, Zoot, Beauregard, Digit, and Bill the Bubble Guy. I really like Dave's story in the Muppets, especially after hearing that recent radio interview. How he was intimitated by the guest stars on Muppet Show and always felt like an imposter in the recording studio (though I think he's always great with a song!). He's a regular guy who was given the chance of a lifetime, through talent and perserverance. change a once melancholy Gonzo into a heck of a world-wide happy success. You go to someone and ask "Who is your favorite character on TMS?" We always get the answer (usually) "Gonzo!" Gonzo was a character that started out as a gloomy outcast. Now, he is a ball of blue energy that has kind of calmed down to some extent though, we will see about that when the next production occurs. Dave Goelz is just fabulous! Very true, Gonzo was always my favorite character when I was a kid, he was just so bizarre and funny. It's a great achievement to take a troublesome character and develop him into something so creative and popular. one of my favorite Dave Goelz muppeteering moments..
- when they're watching the Muppet Babies video in A Muppet Family Christmas, I love the thing he does with Gonzo's eyes after he says "what a handsome devil I was".. or whatever he said.. it was something like that. I don't know what I adore in the melon-headed muppet. Later, Gonzo then became a favorite. Ain't it just cute, Dave actually had Gonzo kind of show how he personally was feeling as he started out. Kind of using Gonzo as a reflection to what he could not express..
We've talked about that on the RHLC, how the perfomers often seemed to use the puppets to express themselves. And you know what, he said at one of the panels that he still sings I'm Going To Go Back There Someday to his kids each night. That's so cool. I definately think he's an underrated performer. He took Gonzo from a one-shot character and made him really broad, interesting, and funnier than ever. And his characters all have a bit of a zing to them, like Bunsen, who surprises me sometimes with the things he says, and of course Boober and Travelling Matt. So quirky yet loveable! Whoopie! a Dave Goelz fan thing! Can I come too? Can I PLEEEEESE? OK, I think I got a bit too into it. *Wipes feet without waiting for an answer and hops deftly through the door, tripping briefly over the doorjamb but landing in a neat reclining position on a conveniently placed cushion. That's how I was at the RHLC <3.